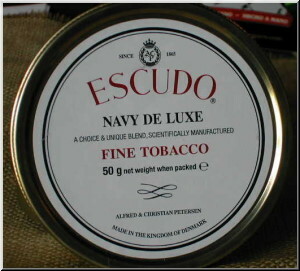 Escudo Navy Deluxe is the gold standard of Virginia/Perique blends, and has been for more than 140 years. Choice US grown Virginias and slowly fermented Louisiana Perique are combined, then pressed and spun, finally being sliced into coins. The flavor is lightly sweet, but has nice depth and a pleasant amount of spice. Even though it has been made by a number of different companies during its lifetime, Escudo still reigns supreme among Va/Pers.